This week, the legendary aircraft carrier USS Enterprise (CVN 65) completes her final journey. Her return to her Norfolk, VA homeport this weekend will mark the end of 51 years of active service with the United States Navy, and 25 overseas deployments. Enterprise, the world’s first nuclear powered aircraft carrier, was commissioned in 1961. She served the nation proudly during some of our most dangerous conflicts, from the Cuban Missile Crisis, to the Vietnam War, all the way through our recent wars in Iraq and Afghanistan. Enterprise is scheduled for inactivation on 1 December, following which she will be defueled at the Huntington Ingalls’ Newport News Shipbuilding yard where she was built, and then towed to Puget Sound Naval Shipyard for scrapping. Unfortunately, due to the complexity of removing the ship’s eight nuclear reactors, it will not be possible to preserve her as a museum ship. 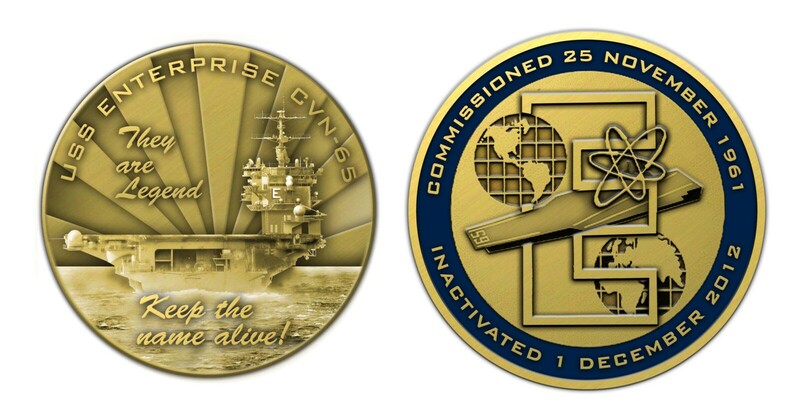 The Naval Historical Foundation has commissioned a commemorative coin to mark the end of Enterprise‘s service. The coin is bronze, 1 ¾ inch diameter, made in America by Northwest Territorial Mint. The obverse side features a depiction of Enterprise steaming off into the sunset, with an adaptation of the ship’s motto, “We Are Legend” transformed into “They Are Legend,” to pay tribute to the eight ships that have borne the proud name, Enterprise, and the tens of thousands of Sailors that have sailed and steamed those ships for over 200 years. 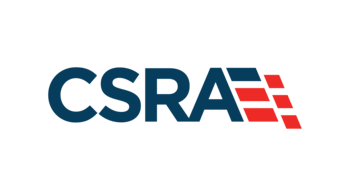 In addition, the coin exhorts the Navy to “Keep The Name Alive” by assigning the name Enterprise to a new-construction ship, preferably CVN-80 of the new Gerald R. Ford-class of nuclear-powered aircraft carriers. The reverse side of the coin displays the ship’s insignia, along with the dates of commissioning and inactivation. 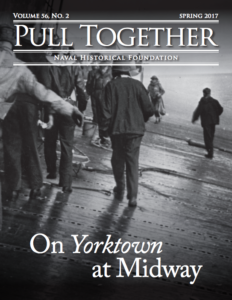 This coin will be available for purchase at $15.00 plus shipping through the Navy Museum Store at the Washington Navy Yard beginning in December 2012. It can also be pre-ordered in advance through the web at our online Museum Store. ORDER YOUR COIN HERE AT THE ONLINE MUSEUM STORE!